Create a special gift to show your support and to raise awareness of breast cancer. This simple to follow, Shabby Fabrics pattern can be used as either a cosmetic bag for on the go, or even a pencil pouch. 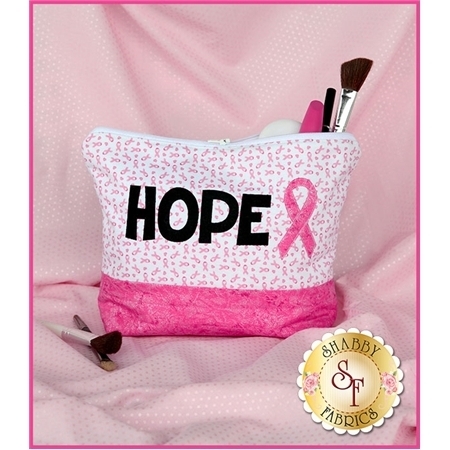 Bag features the word HOPE on one side, and a pink ribbon on the other. 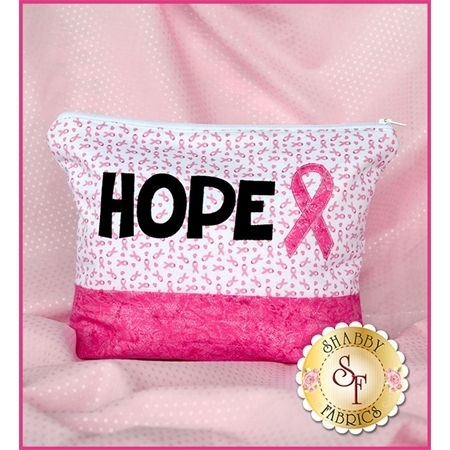 Bag measures 10" W x 7½" H x 3" D.
Love the Pink Ribbon Shabby Shapes you see featured on the bag? Check out all of our laser-cut applique shapes here for your next fun applique project! Show your support by creating your own breast cancer project! Add the beautiful Hope Seventh Heaven Set for a beautiful assortment of pink prints.